The hour was late and in attempting to hurry back to camp, I inadvertently misjudged my ATV’s ability to successfully navigate a sizeable mud filled obstruction and was immediately and hopelessly mired. Having suffered through multiple back operations and lacking a wench, I was in the middle of contemplating the long and arduous walk back to civilization when I suddenly remembered I had some rope and several carabineers packed into the back seat of the ATV. Equipped with the right tools and knowledge, even the most basic equipment can be fashioned into a simple machine able to greatly add to a person’s ability to maximize their strength, both reducing fatigue and the potential of personal injury. The z-pulley system, learned during my experiences mountaineering on some of the highest peaks in North America, is commonly used in wilderness rescue situations such as rescuing a climber trapped in a crevasse. The “Zs” practical applications, however, stretch well beyond the mountains. In the back country, the “Z” is useful for hauling out mired ATVs, pulling a moose out of the woods and even for recovering a boat pinned in whitewater. A simple arrangement of ropes, carabineers and pulleys, the “Z” provides a three to one (1 pound of force to move 3 pounds of weight) mechanical advantage, allowing heavy objects to be moved with limited manpower. 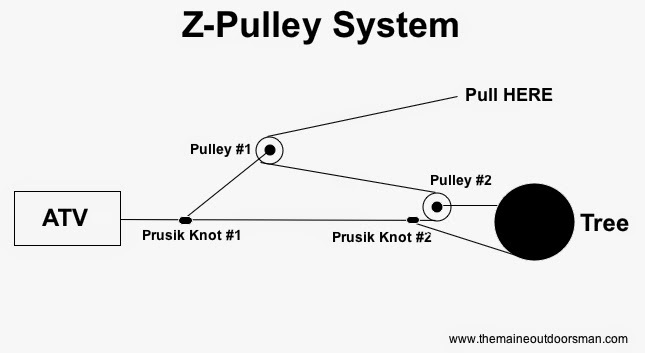 Similar in function to a block and tackle system, the “Z” employs the use of (1) a length of high tensile rope approximately 100 feet long, (2) two pulleys, (3) two shorter lengths of rope of smaller diameter than the main line for tying the two prusik knots and (4) a length of high tensile rope for attaching the “Z” to the anchor. 1. Establish an immovable anchor capable of supporting the full weight of the intended load. 2. Thread rope through pulley #1 and pulley #2 and tie rope to ATV. 3. Using a smaller diameter piece of rope, tie prusik knot #1 a few feet in front of the ATV on the main rope. Attach the smaller diameter rope to pulley #1 using a carabineer or simply tie it into the eye of pulley #1. 4. Using a smaller diameter piece of rope, tie prusik knot #2 a few feet in front of pulley #2 on the main rope. Attach the smaller diameter rope to pulley #2 using a carabineer or simply tie it into the eye of pulley #2. 5. Attach pulley #2 to the anchor point using the smaller diameter rope and carabineer or simply tie it off to the anchor point. 6. The operator then pulls on the free end and adjusts the placement of prusik knot #1 as needed. When operating the “Z” system, constant attention should be paid to the anchor, movements of the ATV, and the condition of the main rope. To help mitigate these dangers, people should be well clear of the ATV, anchor and lines unless they are operating the “Z”. It is also advisable to attach a jacket or life vest to the end of the main line close to the ATV to decrease the chance of the line breaking free and creating a serious flying hazard. Should the main rope slip out of the operator’s hands or the operator need a break from hauling, prusik knot #2 is in place to arrest and hold the position of the main rope, keeping the ATV from recklessly falling back into its beginning towing position. This mechanical safety, however, should be cautiously trusted. While the “Z” hauling system can be set-up to function using carabineers instead of pulleys, the mechanical advantage is much less due to the added friction caused by the rope running through carabineers. The added money for a couple pulleys is well worth the investment. When buying pulleys for your “Z”, it pays to buy a special climbing pulley like the Petzl Oscillante. Climbing pulleys are able to be easily clipped on and off the main rope, while standard pulleys require a user to thread the main line through them to place them in the correct position. Costing under $20, climbing pulleys are a thrifty investment that greatly simplify setting up and dismantling the “Z” system. Practice makes perfect, so before venturing into the backcountry and suddenly needing to set-up the “Z” (likely in the dark and during a thunder and lightening storm), I caution individuals to first setup and operate the “Z” first in their backyard as this tends to decrease frustration and increase safety.